Traditional vs. Montessori vs. PROGRESSIVE – What is a Progressive School? Posted on March 9, 2011 by teachertinazamora	This entry was posted in Philosophy. Bookmark the permalink. Hi Teacher Tina! 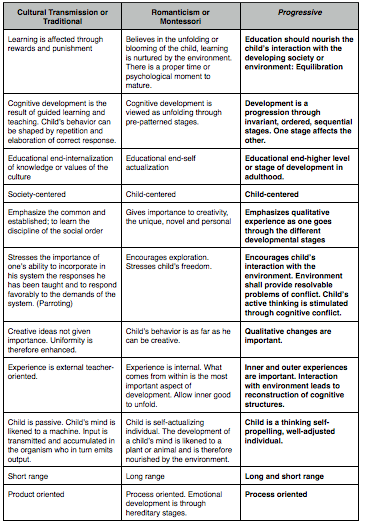 In layman’s language, how will you differentiate montessori from progressivism? 🙂 Is it possible to use both the montessori and progressive method in teaching preschool children? I heard some schools adhering to both methods and I doubt it if its possible. Can you recommend a progressive school in Taguig or Makati area? I want to enroll my two children (a 5-year old and a 6-year old) in a progressive school this coming school year. Thanks you for your blog site = ) I have a son age 3 quite smart for his age, but needs to develop his social skills. He just attended a 10-day Smart Start class, he only joins in doing activities (& not song/dance). Hope you can give advise to young mom like me on best way i can nurture and develop his skills and introduce school & classmates to him. Hope you can also recommend progressive schools. Thanks in advance. Thanks for this comparison. My husband and I are looking for a “big” school for our four year old son and we are looking at traditional, progressive as well as other alternative methods. While progressive holds some attraction for us, I noticed that based on the comparison above, progressive education doesn’t seem to touch on the child’s inner being. The above is a summary I guess, so it doesn’t cover all aspect of progressive education. As it is important to us that the child knows himself to be a soul (and not just a physical being in a physical outer environment), it would be great if you can tell us how progressive education helps a child in his inner life. Thank you for the information that you provide in your blog. Hi Mommy Clarisse! Your child’s “inner being” or soul, I believe, is a topic of faith. You may choose a school espousing your faith like traditional or progressive Catholic schools. Progressive Schools are usually non-sectarian. This is because progressive schools are open to children of all faith. The spiritual life of a child, I believe, is strengthened at home and the in the church/service that the family attends. Hope this helps! Hello Teacher Tina! Can you recommend a progressive school in Iligan City, Lanao del Norte, here in Mindanao. Thanks a lot! I’m curious how you would say Waldorf fits into this comparison. From a 1st time mom’s point view this is really very very helpful. Im having a hard time understanding the differences of these 3 teaching methods. My husband and I are now scouting the area for either progressive or montesorri school. But after reading through your blog, I think we’ll enroll our daughter to a progressive school na lang. it so happened that im browsing and looking for a school for my lovely son who is 2.5yrs old and its amazing that i was able to read your blog about progressive and the traditional school. thank you so much for these information which really helped me a lot. now im scouting for a good progressive school for my son, im currently leaving at cainta rizal near sta lucia mall, i just hope you can recommend also a good school for my kid. thank you and im looking forward to reading more about your insights.. I am not able to differentiate the “Progressive” definition above from my experience of being a parent to a child who has been attending a US Montessori school for 9 years now. It seems to me that both the Montessori and Progressive columns are saying similar things. I don’t know if there is a big difference between Montessori schools in the Philippines or if the differences are driven by the ideas of the teachers running such schools. May I kindly ask for your expert opinion, please. I checked out JASMS in Quezon City. Their Elementary Dept. principal was very warm and informative. I did a lot of reading about the school before visiting it. I have to say that I am impressed with their claimed teaching method which looks like a blend of Montessori and progressive to me. I also learned that the school is in the middle of constructing a new elementary building. This made me glad because their current facilities are old and worn and look outdated. But to me that’s secondary to the quality of education. They don’t charge that much anyway (P40T for Level-1) so I am not going to say that they are overpriced like A LOT of schools out there. Our child is currently thriving in the progressive international school that she is currently going to (just turned 7 years old; Level-1) and we are happy with the school and the staff. By the way, our child was born and raised in the US and has only spent the last 2-years in the Philippines. However, we might have to move somewhere near EDSA, mainly for business purposes so I started looking for a Montessori or progressive school that would be situated anywhere in between EDSA-Munoz and EDSA-Aurora Boulevard. Mind you, I did very extensive research 🙂 And I was surprised to find out that there are very few quality choices based on my requirement of accessibility/teaching method/quality of teaching/class size/appropriate tuition fee. And one those that got my attention was JASMS. Even though this was not the first time I heard of the school (I actually had friends back in the day who went there), I was so surpised to know that they are probably the first proponent of “the progressive method” in the Philippines. I must say that my few acquaintances who attended that school are confident, vocal and quite smart. My question to you is “What is your opinion about JASMS – after all these years? I am aware that it is common for any school’s credibility and standard to go up-and-down. But I just want to get an unbiased opinion from someone neutral who is not out there to “sell a school” or who has a child who actually goes to a certain school. I was told that they still implement the same teaching method/philosophy that they introduced to the Philippines so many years ago. As they say, “A Mercedes is a Mercedes, no matter how old it is.’. But I just want to find out what is your honest and expert opinion about the CURRENT state of JASMS? Thank you and more power to you. I have been reading your blog and it’s a big help. Anyways my daughter is turning 2 this May and I have already been scouting for a preschool for her. I live near ULTRA and was thinking of Second MOm.Until I came to know about Preppi International School. I have not gone to the school yet but I liked what I read from their site. 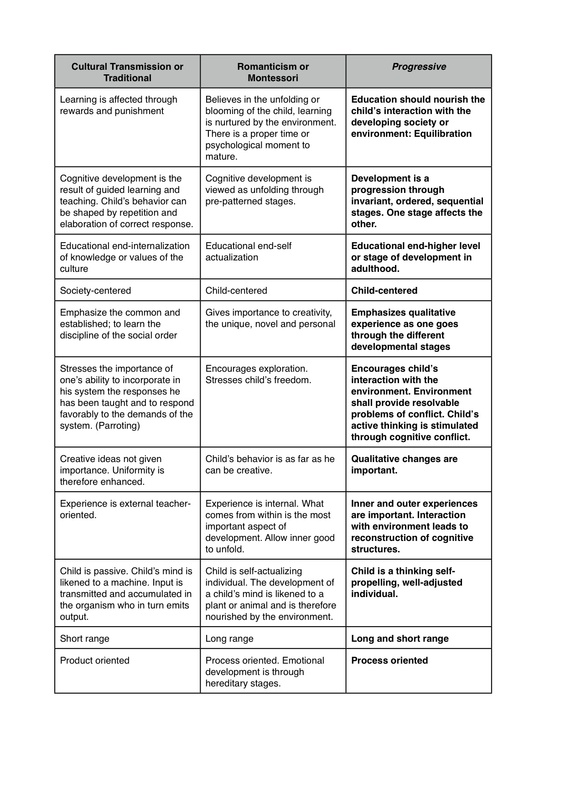 Problem is How different is Montessori type to a Progressive teaching? Do you have any feedback on Preppi? What about Aheadstart Progressive Learning? What can you recommend for my daughter. Progressive is my choice because I do not want to stress my daughter and would rather she discovers. Is Preppi too different from a Progressive preschool? Hi teacher Tina. I have a 4y/o daughter studying in a montessori school. She is one of the outstanding students in her class however I noticed that she started getting bored on their lessons. When I dropped-by their school one day (she is normally with her yaya), I found out that they have less play, more studies. I am thinking that my daughter feels very pressured because of that and she sometimes tells me that she doesn’t want to go to school anymore. That’s why I am thinking of transferring her to a progressive school, but isn’t it too late for that, or there is still hope? Mommy Jen, I believe you should speak to the directress of the school or the teacher of your daughter’s class. Is the change in activity part of the curriculum? Why do you think she is bored with the lessons? Did she tell you anything that happened in class? i have a 4 1/2 y.o. son who had a mild delayed speech. mandaluyong area kami. i enrolled him in a small, private, traditional school. they were 5 students and 1 teacher in his class. i asked his classmates’ mom regarding their teacher, and they said that she’s good. naguguluhan nako what to choose for my son kung progressive or montessori method ba dapat for him. kasi i think di pa sya pwede sa traditional dahil sa dami ng assignments. and lesson na tinuturo ngayon, tom iba naman kaya di sya gaano makahabol. my mga nresearch kasi ako na ok ang MONTESSORI sa DELAYED SPEECH pero ok din ang PROGRESSIVE.. may nahanap nakong prog. school kinderhall sa mandaluyong but wla ako masyadong makitang feedbacks and h.e. montessori center din. un kasi un mga school na pasok sa budget…. help nman po pls… thank you..
Hello Teacher Tina, May alam po ba kayong progressive school malapit sa Dela paz pasig city? Under sya ng traditional school sa Las Pinas at lilipat po kami ng Pasig city. Hoping you can help me. thank you. May i ask also if you can recommend me a good school near novaliches, caloocan city that my child adopt an english language? Hope to hear from you soon, Thank you very much. There are a lot of schools claiming that they progressive or montessori, and even waldorf. But how should a mom scouting a school knows which one is legit? I hope there is a compilation of reputable schools that offers these practices. Mommy Angela, you can browse through this blog or our site http://www.teachertina.net for tips in scouting schools for your child. You may also email questions at teachertinazamora@gmail.com . Hope this helps! Can you recommend a very good progressive school/preschool in Taguig other than 9th avenue school in fort? Hi Mommy Cathy! You can try out for Nest in October. Are you familiar with our school? Is there a schools accept students in 2nd quarter of the school year? Can you recommend a Progressive School in Pasig that have a small student ratio in a classroom and accept student with ADHD. My son is having hard time blending in his school because of the big ratio of student in one class room. I am planning to enroll my 2yr old daughter to school however i am having a hard time deciding aNd choosing which school suits her best. Some of my options are brentwood international school who said that they are using the reggio emilia approach, the problem with that i encountered with this school is the schedule because it is from 8am to 2:45pm which i think is too long for my child. Another option is the naga city montessori school and raya school of naga. Can you suggest on whats the best school here in our area? We are living here in naga city, camarines sur. Hi. Do you heard of St. Diminic College of Asia? What do you think of that school? Im planning to send my son to nursery at st dom. Do you know their teaching approach? Thanks! I am currently scouting for a preschool that would best fit for my child and my interest. Here in Cainta, I happen to come across with schools stating that they combine traditional and progressive teaching. Is it possible to combine the two? It’s quite absurd, having to have these two teachings as looking at your definitions above… they’re very different. I would like to ask then for your tips on looking for an authentic progressive preschool. Thanks! How did they explain the combination of the 2? Though it is true that all schools are under DepEd , PRESCHOOL should be more progressive if not entirely with little “traditional” traits like report cards and exams. I have please send me the best school for my 2 and 3 year old children in cubao area i still don’t know how to decide whether progressive or international is best for them. thank you.